Mouse, designed to complement the 2015 class of HP Business PCs. into a smaller, space-saving design. The comfortably intuitive, low-profile, quiet keys make data entry easy. 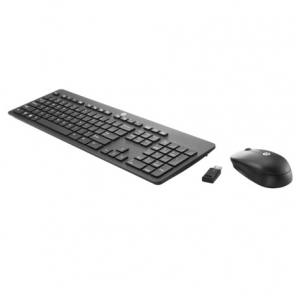 • Interact seamlessly with a full-sized keyboard layout that’s designed for either hand. your PC through a single USB dongle that has 2.4 GHz wireless connectivity. • Avoid surprises with convenient software notifications that warn you when you need to change the batteries. • Get the reassurance of a one-year limited warranty.